The Sensa Diet - Diet Reviews: Does The Sensa Diet Really Work? 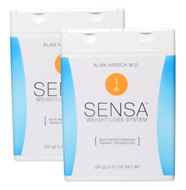 The Sensa Diet is a revolutionary approach to weight loss that engages the senses to encourage the body to eat less. Also known as the “sprinkle diet” Sensa is a food additive that is sprinkled onto food before it is eaten. The substance claims to affect your nerve sensors through your sense of smell to encourage you to eat less at meals. Alan Hirsch, the developer of the Sensa Diet, calls the crystals “tastants” and says that clinical research proves these crystals result in eating less food, and thus weight loss occurs. The Sensa Diet is promoted by the company website and is sold in one-month and six-month kits. The product comes in a variety of flavors that fall into both sweet and salty categories. The salty category includes delectable flavors like cheddar cheese, onion and horseradish. The sweet category offers choices like coca, spearmint and strawberry. All of the tastants are calorie-free, sugar-free and sodium-free. The sprinkles are made from maltodextrin, tricalcium phosphate, carmine, soy and milk. According to Hirsch, the scent of the Sensa sprinkles travel through your nose into your nerve receptors. These receptors stimulate areas of your brain that trigger the release of hormones that suppress the appetite. When the appetite is suppressed, you naturally eat less at meals, saving caloric intake and dropping excess pounds in the process. Through this innovative weight loss approach, the creator of the Sensa Diet claims you can drop up to 30 pounds in six months. The can be achieved without diuretics, fat blockers or stimulants. The Sensa Diet does not provide recommendations for menu plans or exercise programs. Dieters can eat the foods of their choice, but they must sprinkle them with a Sensa product first, and then sniff the food before eating to stimulate the nerve receptors. You feel full much sooner during a meal, so you stop eating before consuming your normal number of calories. People lose weight without every feeling hungry or dealing with some of the other unpleasant side effects that are common with extremely low-calorie diets.